With Coachella halfway through its festiveness, the Insomniac EDC spirit is oozing through the vein of the EDM fans all around the nation. Well, good news is that we now have a confirmed list of DJ’s that will perform at the first leg of the carnival: US East Coast. 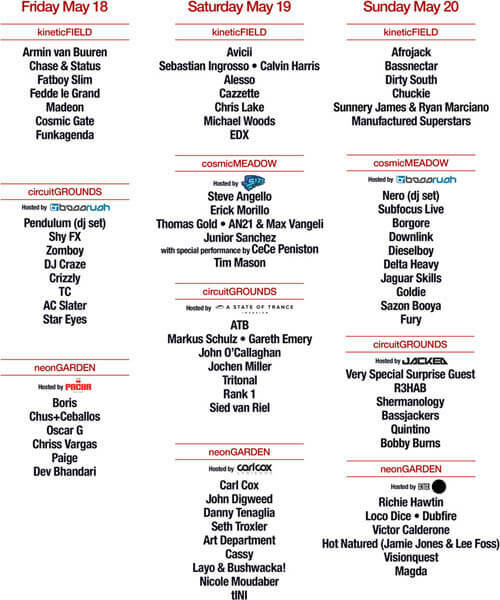 This is the fully confirmed artist lineup for Electric Daisy Carnival at the MetLife Stadium in New Jersey on May 18-20, 2012. The tri-state EDC event was announced in February and the first line of artists were confirmed in early March as we were told that A-list artists such as Steve Angello (Swedish House Mafia), John Digweed (Renaissance and Global Underground), Afrojack and Avicii were going to perform. You can also read about the first part of the artist lineup for EDC Las Vegas 2012 in this blog post.